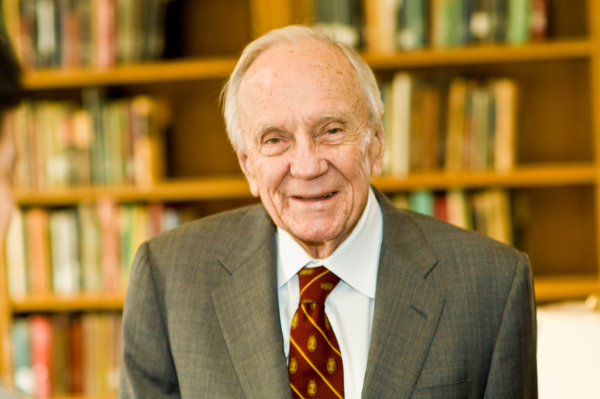 Professor McKenzie was the founder of the University's doctoral program in economics, a program he launched in 1957 when he joined the economics department and which by 1995 was ranked among the top 10 in the country by the National Research Council. Professor Lionel McKenzie was one of the chief architects of modern general equilibrium theory and an "economist's economist" revered for the clarity and rigor of his work. Professor McKenzie's theories and mathematical proofs have provided economists for the past half-century with a way to understand and predict how changes in one area of the economy, such as raising or lowering taxes, will affect other areas of the economy. "He was one of the great leaders in the field of economics in the '50s, '60s and on into the '70s," says Jerry Green, professor of economics at Harvard University and one of Professor McKenzie's Ph.D. students at Rochester. "He was a pioneer in general equilibrium theory, demand theory and welfare measurement, and the theory of economic growth - all central topics in economic theory in those days. He was one of the best," says Green. Professor McKenzie's contributions were to "high mathematical theory - the nuts and bolts of what economists learn - the core of their craft," says E. Roy Weintraub, professor of economics at Duke University who has written a retrospective on Professor McKenzie's work. He was the first to provide the now most widely employed proof for how economies, through competitive pricing, find a state in which the amount of every good supplied is equal to the demand, a condition economists call general equilibrium, says Professor Weintraub. "Every economics graduate student today has to learn that proof." Many of Professor McKenzie's doctoral students hailed from Japan, where his influence is celebrated. He is known as "the father of Japanese mathematical economists," according to the Kyoto Newspaper. He was inducted into the prestigious Order of the Rising Sun, a governmental honor rarely given to American professors. And he received honorary degrees from Kyoto University and from Tokyo's Keio University. Rochester's first doctorate in economics was awarded to the late Akira Takayama, the first of more than 50 doctoral degrees to be earned by students from Japan. A Rhodes Scholar, Professor McKenzie began his academic career as an assistant professor at Duke University. He was elected a distinguished fellow of the American Economic Association, a member of the National Academy of Sciences, and a fellow of the Center for Advanced Research in the Behavioral Sciences. During his career, he published more than 45 academic papers, including the seminal study, "On Equilibrium in Graham's Model of World Trade and Other Competitive Systems" in Econometrica (1954). In 2002, he completed his general survey called Classical General Equilibrium Theory. McKenzie was also a key developer of turnpike theory, showing that, like the roundabout path of a turnpike, the most efficient path to an economic goal like capital accumulation may not be the most direct. A replica of Professor McKenzie's personal office, complete with original copies of his books, photographs, papers, and DVDs, is preserved at Kyoto University in Japan, where scholars from around the world can sift through the 2,200-piece collection. Professor McKenzie's collected papers documenting his work from 1942 to 2004 are housed at Duke University. List of the McKenzie Lectures.